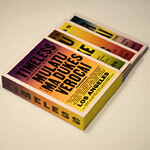 Mochilla's ''Timeless'' limited (4000 individually numbered) box set includes the DVDs of the three Timeless concerts (Mulatu Astatke, Suite for Ma Dukes, and Arthur Verocai) plus downloadable audio for all three, a free exclusive poster, full liner notes, extra features, songs and slideshows. ''Timeless: The Composer/Arranger Series'' is a concert series honoring the composer/arrangers who have influenced hip-hop so profoundly. Timeless was conceived by production house Mochilla in Los Angeles during February and March 2009 and included the performances of over 150 musicians in front of ecstatic sold out crowds. These three historic events were recorded and filmed in exacting detail with Mochilla's unmistakable style. Timeless brings together the seemingly unlike worlds of hip hop beatmaking and orchestral composition. From Mulatu Astatke to J.Dilla to Arthur Verocai, the Timeless Concert Series touched upon the works of three musical giants. Mulatu Astatke: On February 1st 2009 he shared the stage with veterans of the Los Angeles jazz scene Bennie Maupin, Azar Lawrence and Phil Ranelin. The performance is beautiful, showcasing many classics as well as some new material. Suite For Ma Dukes: Timeless 2 celebrated the music of J. Dilla. Composed and arranged for a 60 piece Orchestra by Miguel Atwood-Ferguson featuring special guests Bilal, Dwele, Posdnuos, Talib Kweli and more. This premiere performance is still on the minds of many. The music has been mixed and mastered by legendary producer/mixer, Grammy award winning Bob Power. Power, the man behind hundreds of pop and jazz recordings had also worked with Dilla while he was alive. Arthur Verocai has composed and arranged for such giants as Jorge Ben, Gal Costa and Leny Andrade. But hiphop heads know him for his often sampled (see Ludacriss, MF Doom and Lil Brother) self titled solo album. Timeless 3 saw Verocai's first trip to Los Angeles. His performance of the complete 1972 record brought the capacity crowd to a stand still. According to Verocai, ''he never played the record, alive or dead!'' and hid the record from his family because ''of his disappointment at its failure during the 70s.'' His delight at the opportunity to play this music in its complete form can be seen on the DVD. Please note: due to the weight and size of this box set there may be an extra shipping charge for some orders, depending on shipping address and the size and contents of the order. We will contact you for approval of any extra charges before shipping. However, there will be no extra shipping charge if your order is for one Timeless DVD set to be shipped to the US or Canada.